Your lip secret: Intense colour, soft shimmer. Moisturizing with mineral pigments and botanical ingredients such as rose petals, almond oil and carnauba wax, this lipstick is your lips' new best friend. Tell us your thoughts about Dr. Hauschka Lipstick - NEW! and receive 50 rewards points! I have been using Dr. Hauschka’s lipsticks for many years. They are a clean, viable alternative to the conventional brands & is a wonderful product. I definitely recommend this lipstick! I love this product line, and I really like this new lipstick! It is my new favorite. I like this lipstick. It is smooth. the color is true to its color modifier. Everything about this lipstick is positive. I would buy it again. Perhaps try a different color. All is good. I like the quality of the lipstick, but the color is a little too intense. I thought it would be more subtle. Great color with a nice shine. Not too dense. Just right. Another great product by Dr. Hauschka! 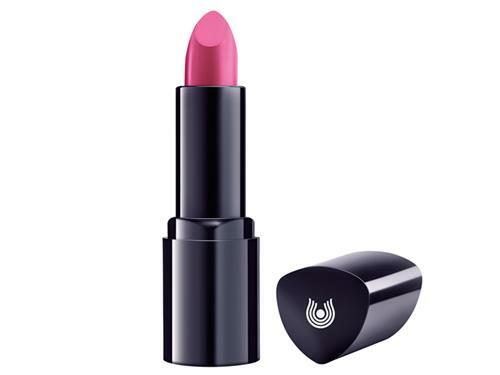 Intensely pigmented lipstick which allows you to customize it and wear it lighter or darker based on the occasion and the mood. Lasting and moisturizing. I will definitely repurchase in Firefly and some of the other beautiful shades. I have been pleased with this tube of lipstick. The color is very pretty, and it stays on well. The color was beautiful and goes on very well. The color seems a little thin and has to be reapplied frequently. The lipstick has a nice scent. I am very pleased with all of their products. They are so pure and not made with chemicals. The lipstick are very good. I love their mascara and cleansing cream, Night time serum. I use many Dr. Hauschka products and decided to try the lipstick. It is a bit too dark for me and not most enough for harsh climates, so I have to add the lip balm over it. I purchased Dahlia, a warm Red. The color is perfect. The texture is light and lovely! It has a natural, herb smell, with no weird taste. Very moisturizing, it has a slight sheen. Not long-lasting on the lips, I needed to apply often, but it feels so good on, it didn't matter! Natural, long wearing, great pigments, and super moisturizing! Will buy again. Would love it even more if this lipstick came in more colors! I live in the desert and Dr. Hauschka lipstick is a must for me. It is the only lipstick that I have found that has a perfect balance between truly moisturizing and staying on. The ingredients are cleaning nourishing to my lips that can tend towards dryness. The company has recently changed all their colors, and I miss my old favorite. But the new ones are the same great quality. I find myself mixing two colors to approximate my old favorite number 9 color. I LOVE this new lipstick formula, feels like a lip treatment, rich pigment, no taste or aftertaste, long-lasting color. Recommend and would buy again.